- Photos of the Northern Lights, or Aurora borealis. Photos of the northern lights over Mt. McKinley, Denali Park, Northern lights pictures over Mentasta Mountains in Wrangell St. Elias Park. Stock photos of the northern lights in the Brooks Range and Gates of the Arctic National Park, Aurora borealis images over the Arctic Ocean, Alaska. Intense aurora borealis display photo. Northern lights photo and reflection in lake, Wrangell - St. Elias National Park, Alaska. Denali and Aurora borealis, Denali State Park, Alaska. Aurora borealis photo, over Denali, Denali State Park, Alaska. Northern lights photo, Matanuska Glacier Alaska. Northern lights over Chugach mountains, Alaska. Northern lights display over boreal forest, Alaska. Stock photo of northern lights over Brooks Range Mountains, Gates of the Arctic, Alaska. Photo of aurora borealis over Wrangell St. Elias National Park forest, Alaska. 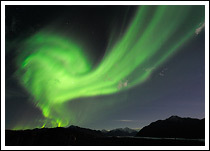 Stock photo of Aurora borealis over the Copper River and Wrangell Mountains. Northern lights over the Dalton Highway. Alaska. Twilight sky and Dalton highway sign and northern lights, Alaska. Active northern lights over boreal forest. Alaska aurora borealis pho over boreal forest. Active aurora borealis over boreal forest. Green northern lights over boreal forest. Red northern lights over boreal forest. Northern lights and sunset over winter Alaska. Photographers and northern lights, Alaska. Aurora borealis display over Spruce trees, Alaska. Northern lights off Dalton highway, Alaska. Strong active northern lights display, Alaska. Aurora borealis over Elliot Highway, Alaska. Strong active aurora borealis display, Alaska. Bands of aurora borealis colors, Alaska. Dalton highway sign and northern lights, Alaska. Corona Aurora borealis photo, or coronal northern lights photo. Active aurora borealis photo over the boreal forest, Alaska. Corona Aurora borealis photo, Alaska. Travel photo of northern lights on Dalton highway Alaska. Photographer shooting northern lights in Arctic Alaska. Aurora borealis, Wrangell St. Elias National Park, Alaska. Photo of Northern lights and Venus, Alaska. Aurora borealis photo from Cleary Summit, Alaska. Green aurora borealis over boreal forest. Northern lights over Tanana River, Alaska. Northern lights north of Fairbanks, Alaska. Northern lights, Wrangell St. Elias National Park, Alaska. Aurora borealis photo and waxing crescent moon, Alaska. Aurora borealis and Talkeenta Mountains, Alaska. Aurora borealis and Talkeetna Mountains, Alaska. Denali and northern lights, Denali State Park, Alaska. Northern lights, Glenn highway, Alaska. Northern lights and photographer, Glenn Highway, Alaska. Northern lights in Wrangell - St. Elias National Park and Preserve, Alaska. Picture of Northern lights display over boreal forest, Alaska. Aurora borealis over McCarthy, Wrangell St. Elias National Park, Alaska. Northern lights and Dalton highway forest, Alaska. The aurora borealis glows over boreal forest. Alaska northern lights over boreal forest.